Hey, now we're talking! Oculus Orbus is one of the more popular/memorable Madballs, by virtue of simply being a gigantic eyeball... or, well, "not-so-gigantic" in this case - Just Play's blind-bagged Madballs are about 1½" in diameter, so these days Occy is only 50% larger than your own eye. If any of our readers out there have a glass eye, try putting Oculus Orbus in there and send us a picture! Gone are the extraneous details from the Art Asylum version of the character, so now the back is just veins. A veiny, one-eyed monster! Show it to all the children! Take it out on the subway! Be like Harvey Weinstein, and force unwilling people to touch it! 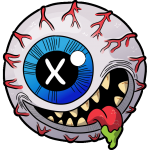 The X in the pupil is better here than it is on the others, since the overall eye is much bigger, and thus, actually gets a pupil beyond the X. 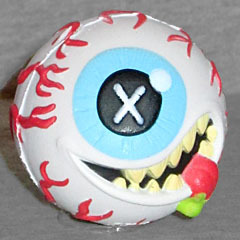 For the first time, OO has a mouth, too - sure, innovation is good and all, but white ball + big open mouth and lolling tongue = this looks like Screamin' Meemie at a glance. Series 2 of the blind bags featured "Mix-Ups," re-releases from Series 1 with new colorschemes. And Series doesn't really do anything to help Oculous Orbus stop looking like Screamin' Meemie, because there he's a pale yellow, which if anything just makes him even more baseball-like!